Large VW SUV planned | What Car? Volkswagen is planning to make a big seven-seat SUV that would sit above its current largest 4x4, the Touareg. The as-yet-unnamed model would be more of a utilitarian vehicle than the Touareg and it would be based on the same platform as the Passat. 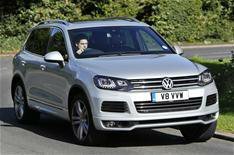 VW's American president and CEO Jonathan Browning added that the car would be aimed at the likes of the Ford Explorer in the US. That would make it about the same size as the Land Rover Discovery. However, Browning added that it would be 'priced significantly below the Touareg' when it eventually goes on sale in America. Bischoff said the new SUV, which is likely to be built at the company's North American factory in Chattanooga, would be primarily aimed at the American and Russian markets. 'It may come to Europe, but we are still working on it and it is in discussion,' he said.